Value of card: "Value"? Houston, we have a problem. The Legend of Claude Raymond: The year was 1966. 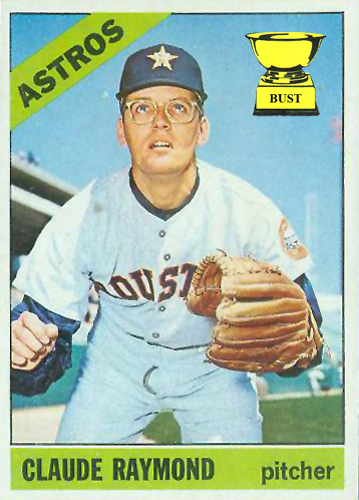 The Houston Colt .45s had been renamed the Astros the previous year after the team moved into the Astrodome (not pictured; great work, Topps). Surprisingly, lush grass wouldn't grow inside a sunlight-depraved indoor stadium, so the Astros brought in German scientist Claude Raymond to create a space-age, synthetic turf for the dome, which had been pegged "the eighth wonder of the world." Raymond and his 12-pound glasses got to work on the project, and after months of toiling he showed the Astros' ownership his invention: AstroTurf, the sorriest excuse for grass the world had ever seen. But it was green, and it had "blades," so the owners loved it. As a reward, Raymond was allowed to try out for the Astros. The scientist's tryout didn't last long, however. Despite being the brains behind the turf on the ground, he always kept his eyes on the sky. Even then, he couldn't catch "popped flies," even the ones on his pants. I've been chasing this card for months. It's expensive.